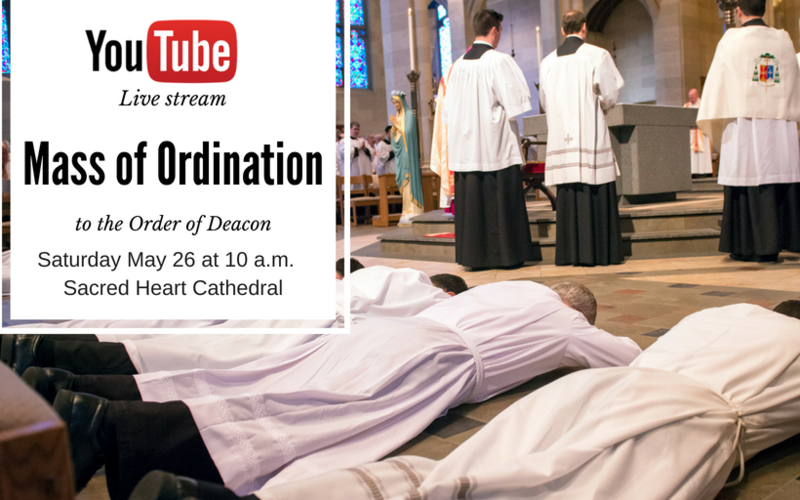 The ordination will take place May 26 at 10 a.m. at Sacred Heart Cathedral, 296 Flower City Park, Rochester. Michael Kristan, 53, said one of the things he looks forward to at ordination is looking into the eyes of the bishop as he is handed the book of the Gospels. “It’s the beginning of my journey and changing my life forever,” he remarked. Kristan’s journey to ordination began in 2007 when he first felt a call to priestly ministry. He consulted Father Timothy Horan, who then was director of the Office of Priesthood Vocation Awareness for the diocese. Since Kristan had previously been married and also had young children, Father Horan suggested that he consider the diaconate. Following an annulment, he decided to begin the formation program in 2012 and was introduced to his current wife, Angela, whom he married a year later. He formally began diaconate studies in the fall 2013. A Rochester native, Kristan attended St. Joseph School in Penfield and McQuaid Jesuit High School in Rochester, and earned a bachelor’s degree in criminology and criminal justice from Niagara University. He is currently a territory sales manager for InterMetro Industries, based in Wilkes-Barre, Pa. The diaconate formation process has been a “wild ride,” he said, noting that he has served at Monroe Community Hospital and has taken part in outreach to the homeless as well as in the neighborhood surrounding Holy Apostles Church in Rochester. He hopes to continue working with the poor after ordination after ordination. “It’s a (population) not reached out to enough,” Kristan remarked. Binh-Yen Nguyen moved to the United States in 1991 so that his family could be reunited with his father, who was one of the “boat people” who escaped in 1979 after the Vietnam War. He obtained a degree in philosophy from Divine Word College in Epworth, Iowa, and then switched career paths to information technology, obtaining an associate’s degree from Valencia College in Orlando, Fla. He went on to earn a master’s degree in computing security at Rochester Institute of Technology and currently works as an instructor in Monroe Community College’s IT department. Nguyen lived in Florida until 2009 when he married his wife, Vy, whose family had resettled in the Rochester area from Vietnam. The couple have two daughters, ages 4 and 7, and are parishioners at Parish of the Holy Family and the Cathedral Community. When he first became involved in the Vietnamese faith community at Parish of the Holy Family, he realized he had a gift for teaching as he led the Liturgy of the Word for children as part of Sunday Masses. He also had a strong background in catechesis from teaching confirmation and first Communion classes in Vietnam. “It would be a good opportunity to share that gift with the community,” said Nyguen, 46, about what he thought about initially when considering the diaconate. But after further discernment, he realized that the diaconate was a call to serve however one is needed. “Even though (preaching) was the initial trigger, I’m open to other ministries that the Holy Spirit will guide me (to) along the way,” he added. A native of Brockport who grew up in Nativity of the Blessed Virgin Mary Parish, Pegoni, 52, earned a bachelor’s degree in history from SUNY Brockport and tried out various jobs until he landed his current position as an automotive parts machinist at JTEKT Torson eight years ago. He initially planned to enter the diaconate six years ago, but held off until his son’s high-school graduation in 2013 to be fully present for his only child’s senior year and preparations for college. He and his wife, Theresa, have been married for 27 years. He described the formation process as academically and spiritually intense, and said his upcoming ordination hasn’t sunk in yet, especially having witnessed so many ordinations as an usher and sacristan at the cathedral. Once ordained, Pegoni said he hopes to serve in bereavement and family ministry. Matthew Walter, 36, is a parishioner at Our Lady of Victory/St. Joseph in Rochester. He graduated from Nazareth College, where he earned a bachelor’s degree in music. He currently attends St. John’s Seminary in Brighton, Mass., where he is wrapping up his third year of theology. Walter began pursuing the priesthood for the Diocese of Rochester in 2016, after having studied for several years to become a priest in a religious community in Europe. Prior to that, he worked as a professional organist and choral director. “Though the beauty of music is a great gift, especially in the liturgy, I wanted to share an even greater gift, God’s mercy and truth,” Walter said of his discernment in an article on rocpriest.org. Daniel White, 34, hails from St. Patrick Parish in Owego, Tioga County. He graduated from the University of Buffalo with a bachelor’s degree in psychology, then took pre-med courses before switching to pre-theology. “During that time, I was able to find more time for the sacraments, prayer, and spiritual reading. In spending more time with the Lord, I came to realize that rather than follow my own plans, I needed to find his plans for my life, and that he was calling me to do this by discerning a call to the priesthood,” White remarked on rocpriest.org. White also is concluding his third year of theology at St. John’s University after beginning priestly formation with the Diocese of Rochester in 2016. He was previously a friar in the Order of Discalced Carmelites on the West Coast.